Altinex’s DA103-302 Ditto-Amp HDMI distribution amplifier, frequently called a splitter, supports HDMI Version 1.3b with embedded high-bandwidth digital content protection V1.0 and V1.1. 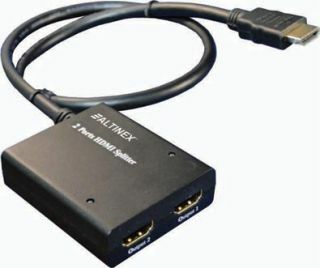 Featuring an integrated 20- inch, 19-Pin male HDMI cable for direct connection to source devices such as a Bluray disc player, the Ditto-Amp enables one device to present simultaneous feeds to two separate HDMI displays with computer resolutions up to 1920 x 1080 and HDTV formats ranging from 480p to 1080p at distances up to 60 feet on each output. Extron Electronics’ VN-Matrix 200 Series and VN-Matrix 300 Series encoders and decoders allow for real-time transmission of high-resolution audiovisual content across standard IP networks. Unveiled under the Extron banner for the first time since the acquisition of the products division of Electrosonic, the VN-Matrix Series is designed for live viewing, collaboration, storage, and playback of high quality AV signals. With the scalable VN-Matrix system, a user can start small and add additional encoders and decoders later to turn an IP network into a virtual routing matrix switcher that is practically limitless in size. The VN-Matrix 200 Series enables streaming of DVI and RGB video, while the VNMatrix 300 Series supports SDI, HD-SDI, and 3G-SDI video. The Crestron V-Panel is designed to be a 1080p high definition touchpanel, and can function as both a touchpanel control interface and flat panel HD display. Featuring VESA mount installation in addition to desktop/tilt and flush wall mount options, V-Panels are said to be positioned virtually anywhere. V-Panels can integrate VoIP communications, embedded PC applications, USBHID control, and onscreen annotation, delivering a complete digital media, control and communication solution. With Crestron DigitalMedia connectivity, protected, uncompressed HD signals can be displayed on touchpanels for the first time. The design of the V-Panel achieves multiple advantages by separating the graphics engine hardware from the touchpanel display. Atlona Technologies’ AT-HD620 is an HDMI-to-Mini DisplayPort Converter capable of up-converting incoming video signals to duallink resolutions up to 2560 x 1440. This new converter solves compatibility issues that have been plaguing HDMI users looking to take advantage of the technologies offered in new Mini DisplayPort displays, such as the Apple iMac 27-inch and Apple 24-inch LED. The new AT-HD620 will scale any HDMI input to match native resolution of either display. With the AT-HD620, hosts of image enhancing technologies are available to users looking to connect an HDMI source to an MDP display.